Have you been searching everywhere on Fiverr for high-quality comments on YOUR blog/website? It will go a long way in keeping your visitors and converting all who visit your blog to permanent visitors. In the world of SEO, Blog commenting is the most powerful link building process without fail. And, if the Backlinks are High Authority, Trust Follow, Citation Flow, Do- Follow then don’t forget (Google Loves Them). Are you looking for High Authority, Trust Flow, Citation Flow , Do-Follow Blog Comments? So, we heartily welcome you to our Blog Comments service. 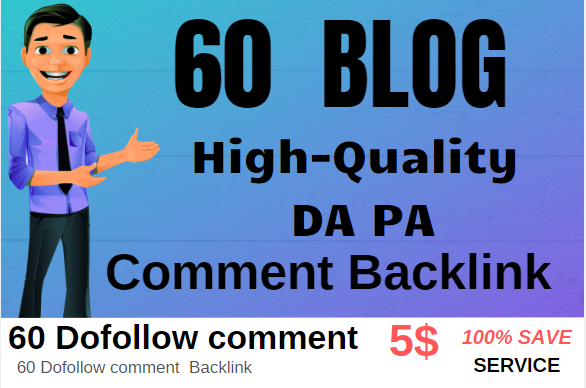 We are the only one selling ______ HIGH TF CF DA PA Blog Comments Backlinks. * 100% Do-follow Blog Comments. * Accept Endless URLs and KEYWORDS.